LinkedIn is one of the most effective platforms for lead gen marketers. 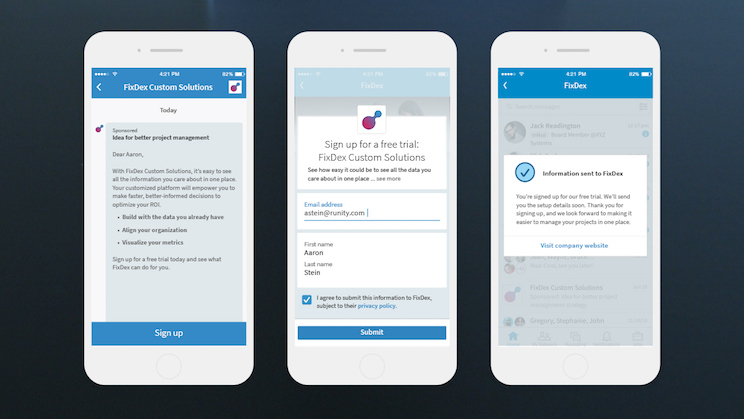 Earlier this year, we launched LinkedIn Lead Gen Forms for Sponsored Content, which made it easy for advertisers to collect quality leads from over 530 million professionals, influencers, and business decision-makers on LinkedIn. With lead gen forms, marketers reduced their average cost per lead by more than 20 percent. Because this delivered such strong ROI, we decided to expand our lead gen capabilities to more LinkedIn products, including Sponsored InMail and Dynamic Ads. Today we are excited to announce that marketers can use Lead Gen Forms on their Sponsored inMail campaigns. With Lead Gen Forms for Sponsored InMail, advertisers can improve the conversion rates of their Sponsored InMail campaigns while collecting quality lead data at scale—including a prospect’s name, email address, job title, company name, and select other fields from their LinkedIn profile. We're also excited to introduce a new Dynamic Ads format to generate leads and content downloads directly within your ad. 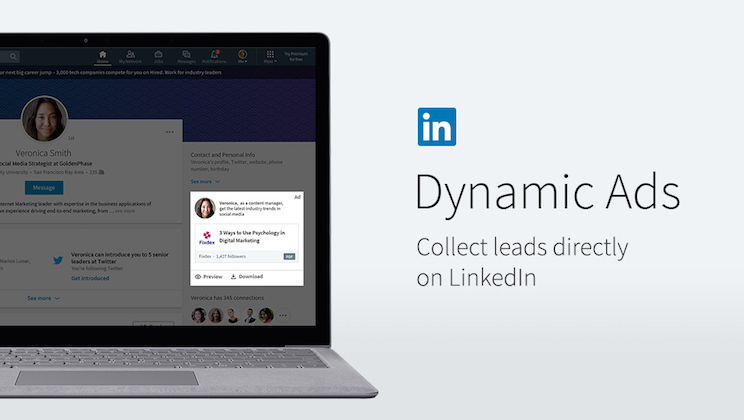 Marketers use LinkedIn Dynamic Ads to build personalized, attention-grabbing campaigns. These ads deliver 2x higher click-through rates than standard display ads because they are automatically customized to include the name, profile photo, job title, or job function of the member viewing the ad. With our newest Dynamic Ads lead gen format, you can instantly generate leads and enable content downloads —such as the download of an ebook or whitepaper— directly from the ad unit itself. Just like with Lead Gen Forms for Sponsored Content or Sponsored inMail, you can access your leads directly from Campaign Manager, or leverage our partners to pass leads to your marketing automation or CRM system. We currently support DriftRock, Marketo, Microsoft Dynamics 365, Oracle Eloqua, and Zapier. With the introduction of Lead Gen Forms for Sponsored Content earlier this year, these new offerings are a natural progression of the momentum we’ve built so that marketers can be more successful on LinkedIn. Check out the blog post to learn more.